Dull edges are hard to work with. You can’t cut the vegetables and fruit evenly and precisely as you want. That’s why you need to make sure the knives you want to use are well sharpened. I mean both your knife in kitchen and your pocket knife if you have a pocket knife, you can see the best pocket knife sharpeners here. In order to do that, you need a good knife sharpener to keep the edges sharp. But electric knife sharpeners are available in hordes. You will end up finding hundreds of models featuring advanced capabilities to ease up your chopping. That’s why we are bringing the list of 10 best electric knife sharpener so that you don’t have to face the dilemma when you think of buying an electric knife sharpener. This knife sharpener is a bit heavy compared to other electric sharpeners. Unlike many other knife sharpeners, this one takes some time to sharp precisely. The Presto 08810 Professional Electric Knife Sharpener is a versatile sharpener which is effective as well as budget friendly. With 3 stage knife sharpening system, this sharpener delivers professional sharpening at home. Dull blades get an excellent edge and proper sharpening at the first two stages, and the third stage provides a mirror like polishing and fine tuning to the blades. The 08810 sharpener doesn’t promote guess sharpening. The interchangeable blade guides automatically hold the knife at the perfect sharpening angle to deliver maximum sharpening results. Chef’s Choice used an advanced 3 stage hybrid technology in their 250 diamond hone sharpener. Hybrid technology combines both electric and manual steps for sharpening knives. The first two stages require electric power for rejuvenating and sharpening the edges, and 3rd stage requires manual honing and polishing. The manual section is made of Ultra-thin diamond abrasives for super sharp polishing. This 3 stage hybrid technology results in strong and durable razor-sharped, arched blades. Makes a lot of noise while sharpening. The Presto 08800 model is designed to sharpen all kinds of carbon, alloy or stainless steel knives. This ever-sharp knife sharpener features pro grade rotating Sapphirite grinding wheels with 2 stage sharpening system to create razor sharp blades in just minutes. Also includes precision blade guides to automatically hold the knife at the perfect sharpening angle to ensure precise result every time. Unlike other electric sharpeners, this Presto model is incorporated with three suction cups for ultimate stability during sharpening. It also includes two receptacles underneath the unit to hold metal filings wasted during the sharpening process. According to customers, the sharpener stops working even if you put the slightest bit of pressure while sharpening. Specially designed to precisely sharpen dull ceramic kitchen knives as well as others. This high-powered knife sharpener features a diamond grinding wheel that can clean off up to 1 mm of scraps from ceramic blades, and a 2 stage sharpening system to sharpen ceramic and stainless steel knife blades with precision. Comes with a universal knife guide slot To hold the knife at a V angle bevel edge. The guide accommodates almost all V-Edge ceramic and stainless steel kitchen knives and allows tip-to-handle sharpening of ceramic knives. And the diamond wheel cartridge is removable so you can easily clean the unit. Not suitable for scissors, serrated blades and non-kitchen knives. This particular knife sharpener features heavy-duty Sapphirite grinding wheels with 2 stage sharpening process. Step 1 is where the blade is rejuvenated and sharpened by reshaping the edge, and at step 2, the blade is polished to give it a bright, smooth and sharp edge. To accomplish the sharpening process efficiently and quickly, LINKYO included dual slots to each grinding wheel to sharpen both sides of the knife and an automatic blade guide to hold the knife at the best angle while sharpening. 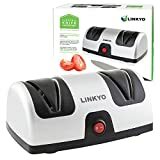 For added convenience and safety, this sharpener comes with a 3.5-foot power cord and polarized plug and heavy-duty non-slip suction cup feet which hold the sharpener firmly to the surface during sharpening. Leaves marks and wears off the knives. Secura has incorporated affordability, quality, and efficiency in this 2-stage electric knife sharpener. As the name suggests, this electric sharpener features 2 stage sharpening system with sharpening and rejuvenating the edge of blades in stage one. And in the 2nd stage, the sharpener hones and polishes the edges to complete the total sharpening process. To hold the unit in place and maintain stability during the sharpening process, Secura has included three non-slip sturdy suction feet to this electric sharpener. 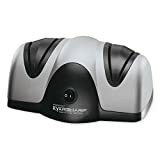 This electric knife sharpener also features an inbuilt receptor to hold the metals and shards wasted during sharpening. The Diamond Hone knife sharpener is a compact countertop electrical kitchen unit which sharpens blunt knife blades in no time. It features a three stage sharpening process for high quality and precision. For stage 1 and 2, Chef’s Choice has used 100% diamond coated disks to deliver fast sharpening and honing. And in stage 3, a revolutionary disk is used for the final polishing and stropping stage where the knife gets an incredibly polished sharp blade. Other than straight knives, this sharpener works great on butcher knives, sporting knives, gourmet chef’s knives and serrated knives. The ken onion edition sharpener from Work Sharp is a multipurpose sharpener which allows you to sharpen kitchen knives as well as other sharp edges like scissors, hedge shears, and blender blades. The flexible and premium abrasive belts deliver you long lasting diamond like edges and features 15-30 degree angled sharpening bevels to ensure optimal sharpening using minimal effort and time. The variation in motor speed allows user to handle any type of sharping starting from grinding up to honoring. The powerful 120 VAC/ 1.5 A motor can sharp your blades up to 60 minutes. Additional belts that comes with the sharpener are also a great addition to your kitchen. The 15 Trizor electric sharpener from Chef’s Choice features a three stage knife sharpening system with a patented Trizor 15 degree XV technology which automatically converts any angle blade to a Japanese style razor sharp 15-degree angle Trizor blade. The sharpener does this by the 3 stages bevel to ensure maximum sharpness. 15 degree edged blades are very durable because of the particular angle. This 15 Trizor electric knife sharpener is suitable to use on Asian-style, American-style and European-style knives. Besides, serrated knives can also be sharpened using this sharpener. During initial sharpening, this knife sharpener removes a good quantity of material and is a bit difficult to use on smaller knives. Work Sharp’s WSKTS Knife and Tool Sharpener is designed to sharpen every single knife in your kitchen. Equipped with six different flexible abrasive belts, this sharpener can sharpen straight bladed knives as well as curved and re-curved knives, filet knives, tanto blades and gut hooks. Other than kitchen knives, the WSKTS can also be used to sharpen a wide range of bladed tools and lawn and garden tools. The premium flexible belts in the sharpener along with interchangeable sharpening guides are used to repair damaged blades and put a razor sharp edge to the blades with a precise cutting angle. The WSKTS sharpener operates using a heavy duty motor for more power with advanced cooling technology. There are lots of things that you should remember while buying an electric knife sharpener. Here I’m going to discuss all of them. Make sure you understand the qualities so that you don’t have to regret after buying. What type of sharpening do you want? The use of this kind of appliance is usually effortless as well as fast since in about one minute it is possible to sharpen the knife. The different models offer different options depending on the type of blade, its thickness, the material with which it is made and its wear level. For example, in a knife with many cutting uses, you need to start from the first stage, which is making the blade rough edges free. The second stage allows sharpening the blade by making it sharp again but coarse. Finally, the last stage of sharpening is the one that guarantees proper finishing of the blade. But for the newer knives, you can skip roughing and start directly from the second stage. So it is mandatory to know which type of sharpening you need. 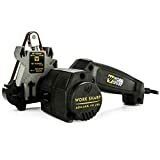 The power of the motor is not an essential for consideration while looking for a perfect sharpener and you can find appliances from a minimum of 20 watts to a maximum of 70 watts. Depending on the type of sharpening, this sharpening tool uses disks in different for roughing, finishing, etc. There are different types of blades. For example, one of a kind integrates both discs and plates, others have a grinding wheel, and very few are compatible with knives and hacksaw blades. The difference between the prices of various models is determined precisely by the plates and grinding materials. These grinding materials can be ceramic, ceramic stone (cheaper), corundum, tungsten carbide or diamonds (more expensive). The use of more expensive materials increases the efficiency of the die cutter and its versatility. Though the size doesn’t make any difference in sharpening a compact one can save you a hassle. You don’t always need a knife sharpener in your hand. If the sharpener is quite big, you might need to spend a lot of storage just to store it. So, it is wise to pick one with smaller dimensions. As we have mentioned earlier, you are not going to use a knife sharpener every day. That’s why buying one that weighs too much is illogical. Besides, it doesn’t even matter if the machine is light or heavy when it is operating. So bringing one that has a compact size and lightweight body is an excellent choice for both professional and occasional cooks as it will take less effort to carry a lighter one. What to sharpen your knives? Buy one from the best ceramic knives here.